was Birgit and Christian's turn to pick them up) and saying "See you later"
islands. The wind against current phenomenon caused a bumpy and wet ride. an unusual direction. The gradient wind normally comes out of the SE here. 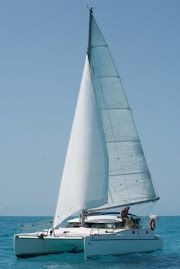 15-20) and with reefed sails, we moved NNE at a pleasant 7 knots. skirted us, with only some sprinkling to be felt. towards the equator, where warmer weather and longer days await! Well done. And please keep posting. It is very interesting. Are your friends on Pitufa etc coming north as well? Always nice to read your comments, even though it sometimes takes weeks before we get to see them, being off line in most of these remote islands. We made it safely to the Marquesas, which are very special and interesting. Pitufa arrived here as well and we met some old and new friends the last few weeks. Gambier to Marquesas - Day 2: Sun! We’re off to the Marquesas!